In last month the first prides have taken place in Europe as the start of the European pride season. And while the pride season is just under its way, we have already encountered the first attacks on pride events last weekend. 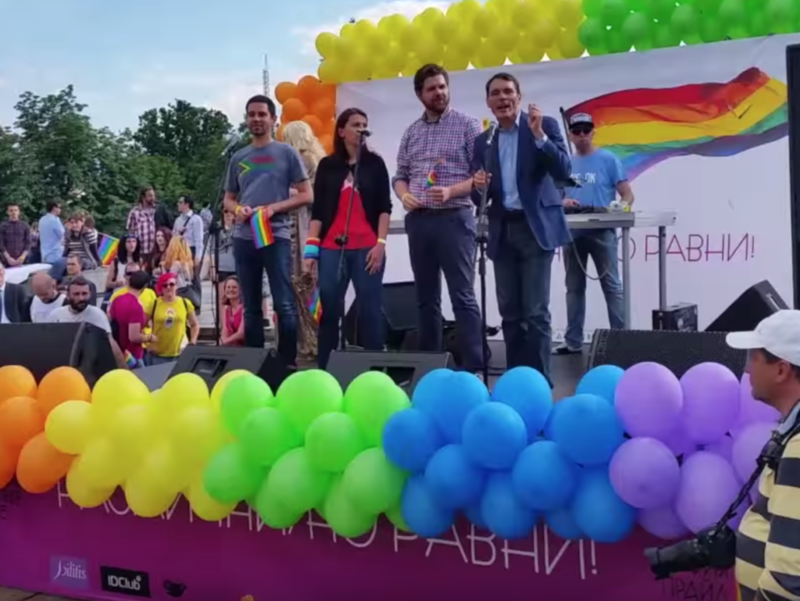 In Moldova capitol Chisinau the pride took place on May 22. After years where the authorities tried to ban the parade, this year the parade was approved by the authorities and placed under heavy police protection. Moldova has still high levels of homophobia. The pride march was attended by around 200 people and only lasted for 15 tot 20 minutes before the police rounded up the participants evacuating them into busses. A security measurement that was felt needed to avoid clashes between orthodox religious people that started to throw eggs and stones at the participants. During the post-march press conference, Anastasia Danilova, executive director of GENDERDOC-M said, “Today’s march was the longest in the history of LGBT people in Moldova… I am sure that even half of the people who came to protest against us do not know who (they) resist.”. After the pride event some priests consecrated the street to ‘cleanse’ the streets. In the same weekend the pride in Gdansk in Poland in which around 800 people participated also met with counter protestors. These protester, a group of around 150 people including members of the far right National Radical Camp (ONR), started throwing bottles and stones to the police that was protecting the march in large numbers against the anticipated violence. Although no one could hurt, it was a wake-up call for the even bigger pride in Warsaw in a country with a changing social climate. In just a few weeks’ time the pride will take place in the Polish capital Warsaw. With the up rise of the nationalistic movement in Poland and the far-rightwing government there is every reason to be alert. The same is true for the pride in Kiev in Ukraine, which is going to be held in the same weekend as Warsaw Pride. Last year the pride met severe violence and was hardly protected by the police. Ukraine is known as a notorious homophobic country. With the desire to become part of the European Union it is to be expected that the government will take extra measures to protect the pride this year. However, how this will work out in reality remains to be seen. InterPride sent letters of endorsement and support of the Kiev pride movement to the mayor of Kiev asking to make sure participants are well protected by the police during, but also after the pride march has taken place. Vice-president of InterPride Frank van Dalen will attend Kiev pride. Belgrade pride is one of the other prides that needs extra attention. After years of a scattered inner-city and brutal attacks by the nationalists last year the pride was without incidents. But this could not happen without thousands of police-officers safeguarding the pride. Although the resistance from society towards the pride is declining, the balance can still easily get disrupted. The same is true for the pride in Sofia in Bulgaria. It is not without reason that participants, when they leave the pride march, are requested to leave all rainbow materials, pamphlets and other materials, that can expose them as pride marchers, behind. In recent years big positive steps have been made in Eastern Europe. But as the attack last weekend shows, there is every reason to stay alert as the pride movement in Europe keeps fighting for the right to be visible and vocal.